American actor Leonardo DiCaprio lands on the Wall of Shame today for one statement he made in his new film, Before the Flood. I do this very reluctantly, because at the same time I want to applaud the man for investing so much time and energy into producing this movie. Thank you, Leo! Please take my remarks here as encouragement to reflect and up your game even more. You’re doing great work. It can be even greater! DiCaprio assembled some amazing talent to create what I will call a moving update on Al Gore’s An Inconvenient Truth. The team included Executive Producer Martin Scorsese, Director Fisher Stevens and Screenwriter Mark Monroe. The Al Gore film did one hell of a job making climate change a household word (okay, 2 words). It was mostly Gore onstage delivering a great PowerPoint presentation. A year later DiCaprio gave it his best shot with his film, The 11th Hour. An admirable effort, The 11th Hour still disappointed. It felt like a stock footage demo reel (a little better than PowerPoint, though), and DiCaprio’s onscreen presence was rough. Ten years later, DiCaprio clearly felt it was time to turn the volume up to eleven. He has delivered. Before the Flood is very watchable, thoughtful, factual and engaging. Applause. It does an admirable job of demonstrating that climate change isn’t some future possibility. It is happening now. It’s costing us a lot of money, and it’s impacting – and costing – lives. We see a jet and Leo walking thru an airport, then getting in his car and driving. The cheap shot here would be to give the writer grief about that “probably.” Probably? Come on. Get real. Now that I’ve taken the cheap shot, let me explain why I was so disappointed by DiCaprio’s statement that Americans probably won’t change our lifestyle. You have to see the scene. He doesn’t seem to even lament that fact. It is just a fact, so we’d better get behind renewable energy technology. 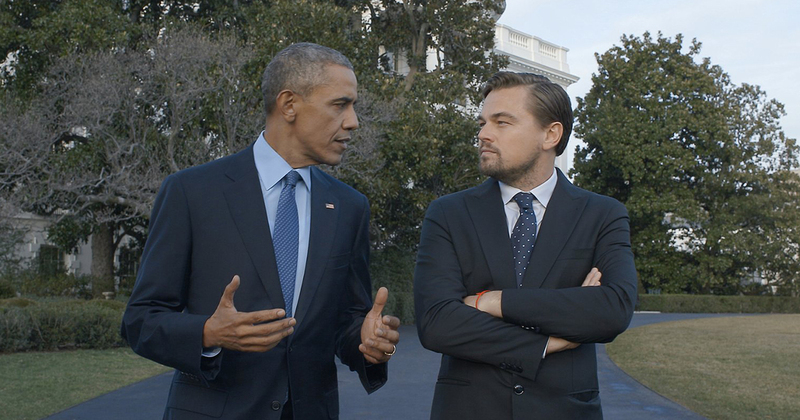 The problem, Leo, is that we cannot continue business as usual, plundering the planet, and 1) expect it to be physically possible to power it with renewables, and 2) expect in the process to preserve the life-supporting ecosystems the Leonardo DiCaprio Foundation is working so hard to protect. I can’t get into the details here, but just imagine the carbon footprint and depletion of nonrenewable resources necessary to manufacture and install renewable energy infrastructure to power our 7.4 billion at today’s various lifestyles, let alone at the lifestyle aspired to by the developing world. And then imagine powering up for 11 billion. You might want to check out Ozzie Zehner’s book, Green Illusions. And, I really hope you know, Leo, that getting a handle on greenhouse gas emissions will not do a thing to resolve the other ill effects of overshoot: inadequate fresh water supplies, toxic and declining rivers and aquifers, fisheries collapse, fertile soil depletion, ocean dead zones, species extinction and nonrenewable resource depletion. And doing this while ignoring overpopulation (virtually absent from the film)? Good luck. Bravo for producing this film, Leo. Now, please step it up and find a way to give us more truth. Ready or not, we need to start hearing it. Let’s get started on the next film. You have the star-power to get the film made and to get our attention. It’s time for The Ultimate Inconvenient Truth. The good news is that trampling the planet isn’t really making us happier; doing the right thing will actually enrich our lives. I didn’t see the movie. But I was intrigued by your comment on the DiCaprio footprint… I would offer just one observation in his defense. DiCaprio, so far as I know, has been most modest with regards to procreation — no children! Less modest, Mel Gibson has a score of 8… That’s a truly mind-blowing column of footprints marching into the future. Hold onto your video camera! Eddie Murphy seems to have jumped one up on Mel… Meanwhile, Steven Spielberg and Kevin Costner are hot on his heels. Sure enough, the film has disappeared from YouTube and cannot be accessed free at national geographic.com, but I see I can still access it free on demand on my local cable system.